Welcome to another week of Travel Photo Thursday. By this time tomorrow all of my grading should be completed, and the marks will be in the computer. Then, it is hustle time for me. I will be going non-stop until I hit the airport bus next Friday, June 21st. First stop Vancouver, and then on July 4th it’s off to Nova Scotia. I can’t remember the last time I was so excited to be spending time in Canada. 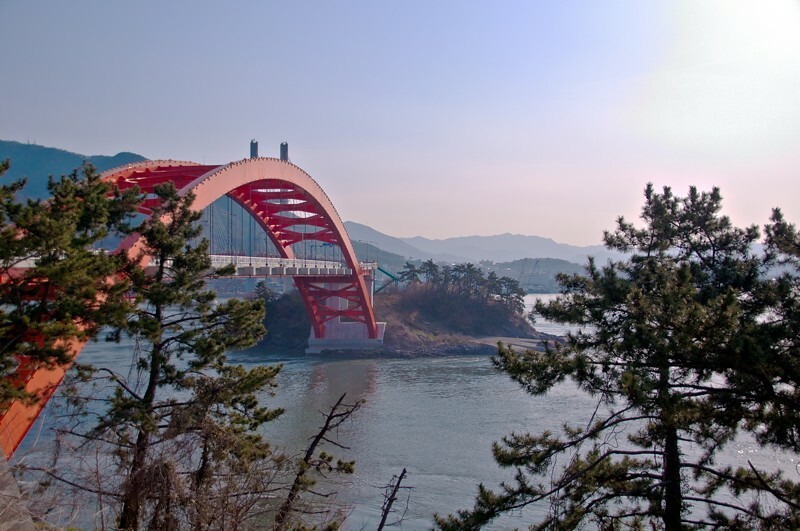 For this weeks Travel Photo Thursday I want to share a few of my favorite bridge shots from Korea. I don’t think it matters where we travel, there is always a bridge to walk across or sail under. All are worthy of at least one photo. 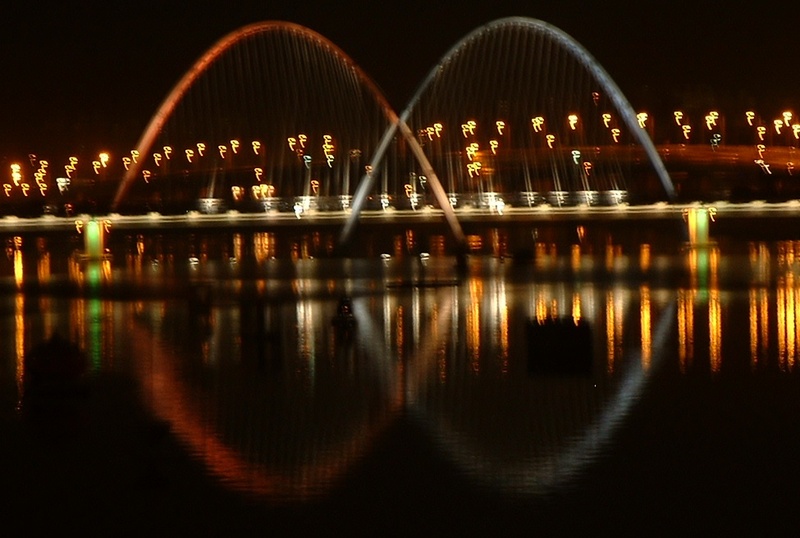 Believe it or not, I live five minutes from this bridge in Daejeon. 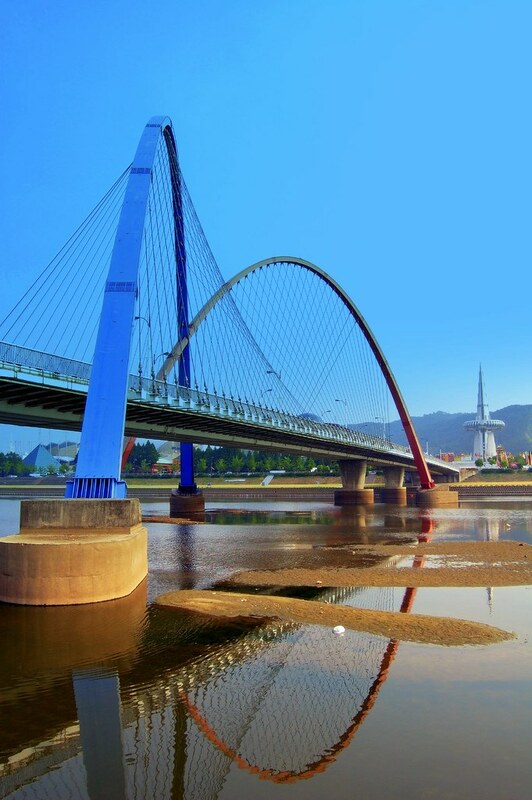 Built for the 1983 Expo, the Expo Bridge spans Daejeon’s Gap River. These days it’s strictly a pedestrian bridge and sees a lot of foot traffic on Saturdays and Sundays. Nongdari Bridge, Jincheon, Korea…billed as the oldest stone bridge in Asia at 1000 years old. 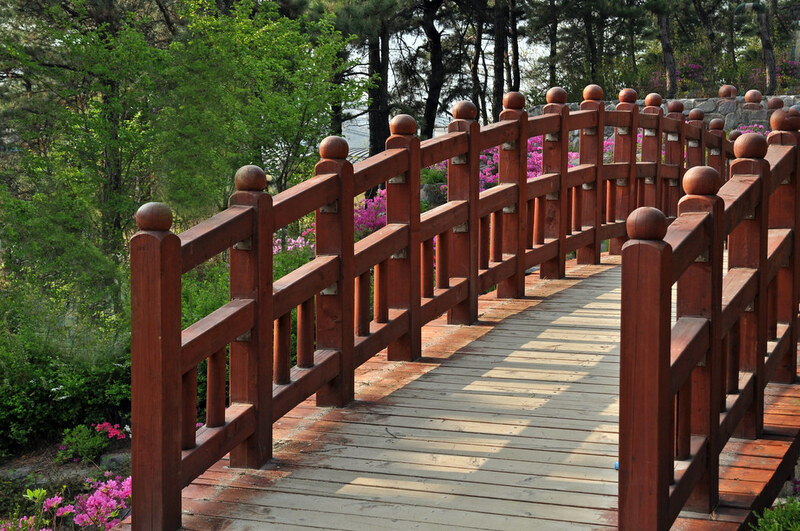 A Japanese style bridge in a park in my old neighborhood, here in Daejeon. In my experience, bridge shots almost always turn out better when you use a tripod. If you don’t have one handy, try to find a flat to place your camera on, in an effort to reduce any camera shake. If you can’t rest the camera on something secure, stand tall with your elbows tucked in. This should help reduce any shake. Love bridges and these are beautiful pictures, Nancie. Great reflection shots too! The stone and Japanese bridges are my favorites. Thanks for the photography tip! It’s so wonderful to hear that you’ll be back in Canada soon. Thanks, Mary. Yes, I am getting rather excited here. Now, just have to get the marking finished! really love the angle of the second picture, but my favourite bridge is the more traditional stone one. 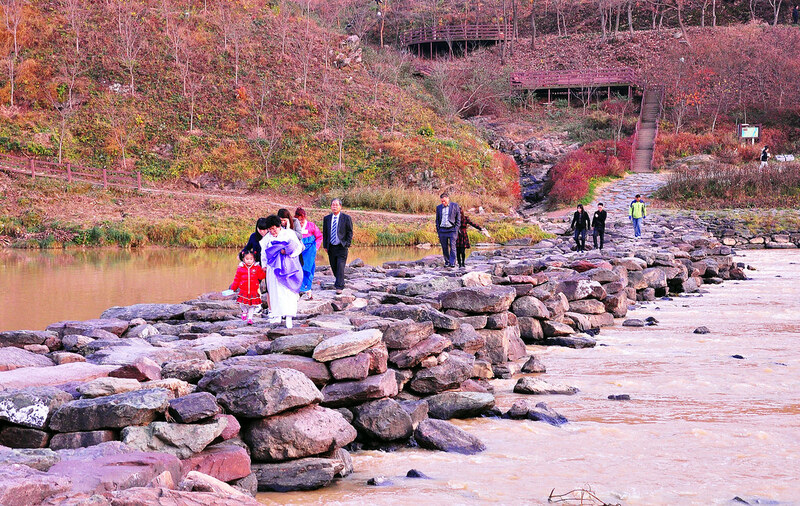 The stone bridge is fascinating, and the ladies in their hanbok really add to it, I think! Love that Nonk.gari Bridge – and what a tale it would have if it could talk. Your second photo is also very interesting – and love the use of colour by the architects. Interesting bridges. I like the modern design of the Expo bridge. Your reflection shots of it are stunning. The evening shot looks lovely even without the tripod. But I say my favorite is the rock bridge. It looks so traditional and so earthy. It’s very transporting. Thanks, Marisol. It’s been a while since I took any shots of the Expo bridge. Must get the tripod out, and take a walk over in the early evening before the sun sets. Nancie I love, love, love your photos of the Expo Bridge. It is not often that reflections are so good, and the colours of the bridge make it extra special. Thanks, Jan. The great colors do lend it to being very photogenic. The gorgeous blue skies helped as well. From the oldest, to the traditional, to the more modern, all wonderful bridges. Bridges can really be a fascinating insight into history. I particularly like old stone bridges, but the modern ones are spectacular too. 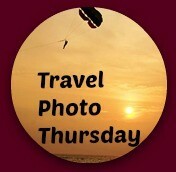 Have a wonderful week and thank you again for hosting Travel Photo Thursday – I never know where it might take me next! Thanks, Jill. I don’t think I ever walk by a bridge without taking a photo. All great photos, Nancy! 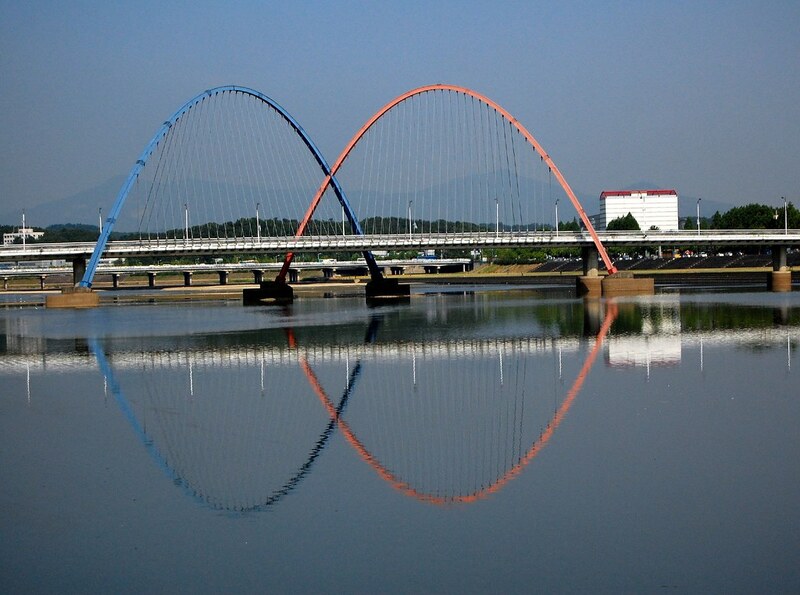 I particularly like the one of the bridge in Daejeon – love how perfectly the reflection is captured in the water. Have a great time on your visit to Canada! Thanks, Lisa. I am really look forward to spending sometime at home! Nancie, I love all the bridges and how wonderful to have such a variety to show us. It would be difficult to choose a favorite one from this grouping – I like them all, but I might be most partial to the old stone bridge — think of the stories it could tell! Jackie, that stone bridge could probably keep us entertained for weeks! Thanks! The stone bridge is definitely a hit. Nice collection of bridges, Nancie! Each is very different from the other. I like the Expo bridge, the stone bridge and the one before the last. Hi Salika, I think each one is special in a unique way. A very contrasting collection of bridges Nancie which together tell some of the history of the country. The photo of the reflections is fabulous but I do love the stone bridge. Have a fabulous trip to Canada…very exciting for you! Thanks, Jenny. Only 5 more sleeps, and I am there! Love all these modernistic bridges. Thanks, Sophie. There are more than a few here in Korea! I’m fond of bridges – the Expo bridge looks great! Just so you know – the only system I can regularly link from seems to be my iPAD (assuming I can still link from there, we’ll see shortly). 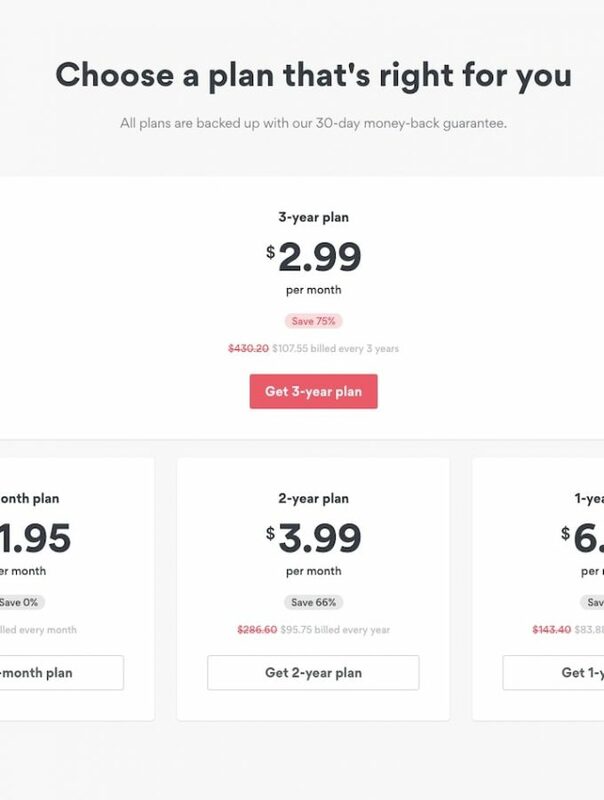 I’m running Firefox at home and that doesn’t work at all. The older version of IE I’m using at work isn’t much better. Enjoy your time back in Canada. I’ll be eager to see your pictures. Love the contrasts here, and all the pictures are lovely. But the first one took my breath away. Thanks, Vera! The colors and sky really do make it special. The bridges are gorgeous. I especially love the stone bridge. Thanks, Tonya. I can never pass up a bridge photo! I hope you get some nice weather in Vancouver! How long will you be in town? Let me know if you need any info. I find bridges very interesting too! Love the reflection of the bridge in your first picture and the stone bridge is really interesting. Great shots! Thanks, Debbie! If bridges could talk, what stories they would tell! I love bridges. I don’t think I’ve ever seen any like that stone one – it looks so natural and fits with the setting perfectly. The stone bridge is my favorite and the place looks so relaxing. It’s now one of my travel goals to be able to walk there! Can’t image the hard work put into building that 1000 yo stone bridge. Nice collection of bridge photos you got there.